I think it’s safe to put the Armenian cucumber in the ‘successful’ category now, although I might be jinxing myself here. The winter squash may be dying, but the Armenian cucumber is as healthy as can be. (Knock on wood.) Heck, we keep stepping on the tendrils that spill over into the path–they keep growing back like some Swamp Thing. 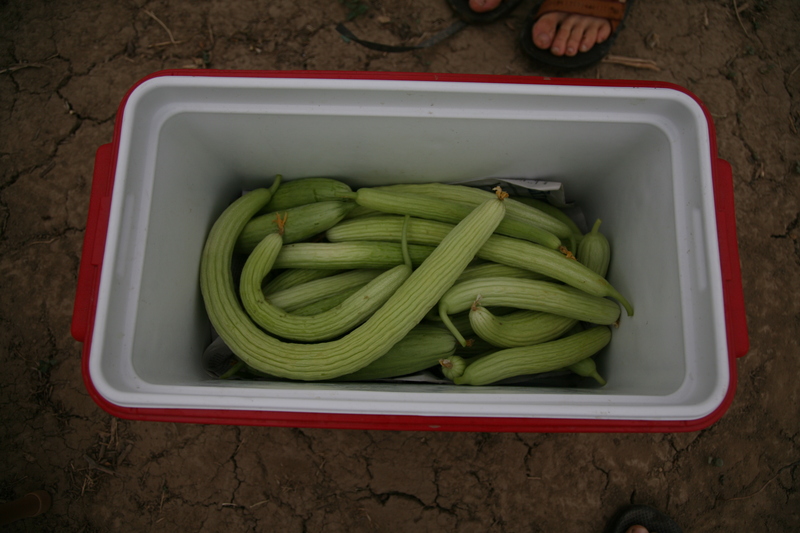 And the cucumbers themselves are somewhat beyond belief: you blink and a three-incher has turned into a two-footer. At the market, although we didn’t sell all of them (the ten percent rule seems to be in effect for our cukes and zuchs — the farmer’s market adage you’ll never sell the last ten percent of your produce because people don’t like buying what seems to be the leftovers), people kept asking about them. (“What is it?” was the most common question.) And I’d say that a third of the people who tasted them–we had a sample dish out–ended up buying them. they look really cool. I’m an especially big fan of the long, curled ones. and they have a serrated surface that looks nice when sliced thinly for salad. I love the way they taste. I’m not a big fan of regular cucumbers, but these are slightly more dense, slightly less watery, and slightly less seedy. so far, we haven’t killed them.